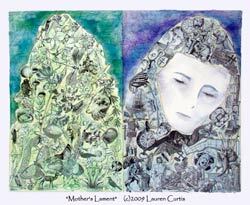 Captivating artists hail from a variety of diverse occupational backgrounds and Lauren Curtis is no exception. Working as a marketing coordinator for a healthcare center for over ten years helped Curtis foster a fascination with x-rays enabling her to view various depictions of the human skeletal frame. 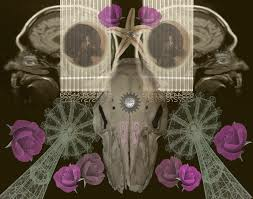 It was through this fascination that Curtis found the inspiration to incorporate x-rays into her visually striking body of work. Each of her works serve as a reflection of the spiritual and scientific wonders of animalia and the human form. Her efforts ultimately culminated into her “X-Rayted Series” comprising photographic collages of human and/or animal X-rays sometimes incorporated with Victorian woodcut etchings of insects, plant life and other subjects. 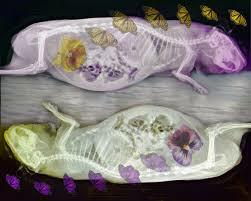 Curtis found a way to capture the form of the x-rays through photographs and retain the transparent look of the images while juxtaposing them with original nature images and photos she took of cemetery and funerary statuaries from across the United States & Europe. Though seemingly macabre, Curtis’ works radiate a distinctive luminousness as her transparent images reflect soft glowing silhouettes contrasted against dark backgrounds. The similarity between these human and animal skeletal structures reflects the congruity between man and nature, a theme which Curtis’ X-Rayted series emphasizes with considerable fervor. “The Feminine”, which is sometimes over-looked. Travel is another major influence in Lauren’s work and the pieces, usually photographs, created from these journeys helps the artist to convey the beauty found in diversity, as well as in the similarities, that run through various cultural belief-systems. Lauren has had artwork and poetry published by greeting card and crafter companies, magazines, children’s books and historical organizations, including the Middlesex County Cultural & Heritage Commission. 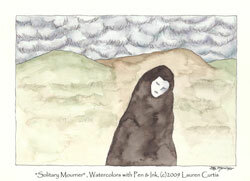 One of her pieces was selected for the permanent collection of the Joyce Kilmer Library in central NJ. Her work has been displayed in private collections, healthcare centers and galleries and was selected for a solo exhibit at Johnson & Johnson World Headquarters, July-August, 2009. She was a featured artist on the Science Channel’s TV show Oddities (2011-2012), was also featured on Germany’s TAFF TV (2015), several NJ/NYC cable /YouTube TV shows and has done radio interviews as well. Lauren has participated in over 100 solo, group & juried exhibitions, won multiple awards and is a member of NJ Arts organizations. Her artwork has been sold throughout the US and abroad and she exhibits her work monthly in gallery shows, art festivals and cultural events. 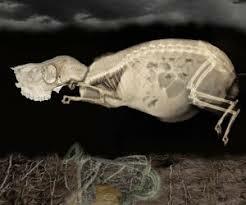 (Xray) Night Root Creature. (signed)Dimensions: 8×10, 11×14, 16×20. While working as a marketing coordinator in a health-care center for over 10 years, I became intrigued with all the x-rays I saw during my career, depicting various states of the human skeletal system. As an artist, I was fascinated by being able to see the inner workings and sculptural forms of the human body and I envisioned a way to incorporate them into my artwork. These x-rays, to me, truly represent the spiritual and scientific wonders of nature and the human body. This lead me to create the “X-Rayted” series, which I began in early 2010 and continue to expand on currently. The content consists of photographic collages of human and/or animal X-rays (I found a way to photograph the actual x-rays and retain the transparent look of the images) sometimes incorporated with Victorian woodcut etchings of insects, plant life and other subjects and juxtaposed with original nature images and/or photos I shot of cemetery and funerary statuary from across the US & Europe. I am also working on new pieces utilizing photos I took of animal bones, feathers and shells (all naturally found objects!). By doing this I can represent the underlying connection between all forms of nature and how life and death are so closely intertwined. (signed) Dimensions: 8×10, 11×14, 16×20. There is a universal connection between all life forms; the microcosm reflects the macrocosm. By utilizing current as well as historical imagery, the symbolism in my photographic collages adds a sense of history, time and place to the pieces. The photographs of the X-rays collaged with the other components detail our existence on earth and how it is both finite and infinite at the same time. I also enjoy the connection between the organic shapes of the human and animal bones along with those of the other natural components in the pieces. This portrays the connectedness amongst human beings with other life forms on Earth. This is the focus of a body of work I’ve been developing over the last few years. Today’s world brings much tragedy, both natural and man-made. It also presents incredible access to knowledge, but deep sadness for the world’s losses. We are left to mourn, but also to seek enlightenment. Exploring these issues via my art practice I seek a pathway to inspire thought and communication about the social issues of spirituality and mortality and how they bond with nature. After studying and embracing Earth-centered spiritual systems and mythologies, as well as traveling to experience other cultures first hand, I’ve developed my own symbols to represent several archetypes that I feel are part of our human foundation. The Mystic/Hermit represents introspection and our quest for knowledge and growth. The Mourner is someone we will all inevitably become, whether it’s to mourn a loved one or a global tragedy (more and more common today). The Tree of Life depicts all of nature, as well as humanity, and is a symbol found throughout history around the globe. The Tree also represents the highest level of wisdom the Mystic can reach. I’ve chosen to explore these ideas through oil, watercolor and mixed-media paintings. As a full time artist, I have been working to not only exhibit this series (part of which will be in a July/Aug. 2009 solo show at J&J World Headquarters as well as Alfa Art Gallery) but my other paintings and photographs as well. I have participated in over 85 shows (group, solo & juried) since graduating from Mason Gross School of the Arts (Rutgers) in 1988 and have been exhibiting /selling work throughout the US & abroad. My art can be found in the collections of several NJ historical organizations including the Middlesex County Cultural & Heritage Commission and in the Joyce Kilmer Library Gallery, as well as in private collections. My work is also represented by galleries in NJ and MA, and I’ve been commissioned to create illustrations for publications, on-line magazines, crafter companies and businesses. 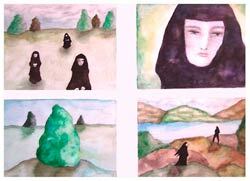 For more information about my artwork, please contact me at forestwalker333@hotmail.com. Parsons School of Design, NYC, NY,USA. Received certificate for honors design course. DuCret School of the Arts, Plainfield, NJ, USA. Drawing and Color Theory courses.